Chicago: Walt Lemon Jr. scored 20 points to lead the Bulls. . 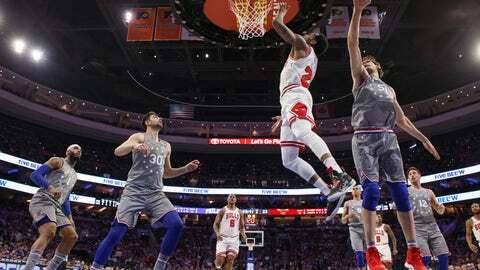 The Bulls were without Denzel Valentine, Wendell Carter Jr., Chandler Hutchison, Zach LaVine, Lauri Markkanen, Otto Porter Jr. and Kris Dunn. … Chicago set a franchise mark for its worst home record at 9-32, culminating with Tuesday’s 96-86 loss to the Knicks. Philadelphia: Jonathon Simmons had 20 points to lead the 76ers. . Brown said the 76ers will go “8 ½” players deep in the playoffs. … The 76ers promoted Lindsey Harding from scout to player development coach. … James Ennis III, who is expected to be a contributor off the bench in the postseason, also was out Wednesday with a right quad contusion. … The 76ers split four games against the Nets this season. .. Philadelphia finished 31-10 at home.